The current outbreak of the Ebola Virus Disease (EVD) in the Democratic Republic of Congo (DRC), first reported on May 8th 2018, is now the second largest and has taken the lives of 433 persons so far. Taking its name from the Ebola river, which runs through the DRC, this highly infectious and deadly disease has historically, but not exclusively, affected people in sub-saharan Africa. Since 1976 when the first initial case reported in the Yambuku village of the DRC, nineteen countries internationally have reported cases within their borders. The disease is zoonotic, meaning it is found as a natural host in fruit bats, and it is thought they transmit it to other animals. Eventually this infection can spill over into humans coming into contact with these animals. Human transmission is through direct contact with bodily fluids or excretions of an infected person. The virus has between a 2-21 day incubation period, and has been detected in human corpses up to days after expiration of their lives. Doctors Without Borders were instrumental in helping to educate the populace about the disease and treating those infected. Fear and confusion are the two greatest threats to treating any disease, particularly in areas where science and technology are themselves new developments in the community. Healthcare workers dressed in full infection protection garments spraying chlorine was enough to cause wild rumors to spread among the populace. Healthcare workers consequently became the subject of vicious attacks resulting from rumors in the local community that the international humanitarian NGO was actually causing the spread of the disease. World Health Organization epidemiologists were forced to flee for their lives as a result of this disinformation. 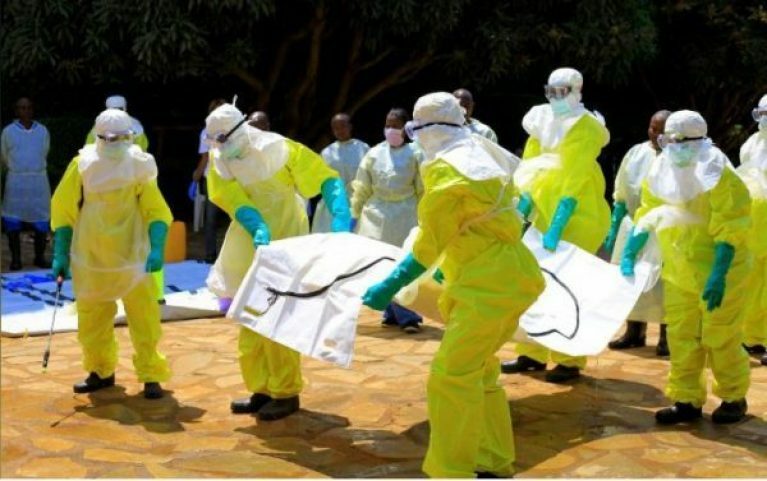 The 2014 Ebola virus disease outbreak, which according to the World Health Organization was the largest since 1976, caused the death of over 11,000 people. Affecting Guinea, Sierra Leone and Liberia, the 2014 outbreak in West Africa was hampered in part by confusion regarding its identification as either cholera or Lassa fever. This time, the identification of the disease was much more precise. Active case finding, infection prevention, safe burials and diagnosis with deployment of mobile laboratories on site have helped reduce the crisis so far. Perhaps the greatest lesson emerging from that period was the realization of how the disease could easily cross borders with the potential to reach pandemic proportions. In response to this, the adherence to strict infection control measures was critical in reducing the spread of the disease. There are five known strains of EVD. The Zaire strain was rapidly identified in this most current outbreak. Due to the fact that the DRC has suffered at least eight outbreaks of EVD since 1976, they have developed a more robust identification system in Kinshasa at the Institut National de Recherche Biomédicale. Researchers have performed extensive focus-group testing on the feasibility and levels of acceptance by health-care workers to adopt this Ebola virus vaccine as a standard of their own care in dealing with the patient population. Obviously, it is critical that health-care workers allow themselves to be vaccinated, not only for their own protection, but as role models to the communities they are serving. In this current outbreak, 26,000 health-care workers in the DRC have been vaccinated as part of a ‘ring-strategy’ which was modeled off the small pox vaccination techniques. In Uganda, health-care workers have been given a recently developed Ebola virus vaccine before any cases have even been reported. An experimental vaccine MP134 has also been recently developed to combat three of the five strains at once. Those suffering from EVD will benefit from so-called ‘ring strategies’, which are methods that have been tried and test with small pox eradications. Vaccine development is the greatest encouragement so far to fighting EVD. In particular, the distribution of 120,000 additional doses of Merck’s rVSV-ZEBOV vaccine will prove critical to managing the outbreak. The international community’s response to the DRC election and the subsequent contest will be crucial to how the EVD outbreak is further managed. During the election it was reported by Jessica Llunga, a DRC Ministry of Health spokesperson, that in the city of Beni (where the spread of EVD is most alarming), health-care workers have been attacked as targets of a disinformation campaign – similar to the events that transpired in 2014. From a global public health perspective, it is imperative to apply vaccination to those in sub-saharan Africa; and hopefully with positive results expand the program throughout the continent. The fear and confusion embedded in epidemic outbreaks also need to be clearly addressed at the outset. It seems natural that public health epidemics will collide with community fears and stigmatization, such as those triggered during the severe acute respiratory syndrome outbreak. Political leaders from the local level to the state authorities are responsible to inform the public with the truth about infection control and transmission. Global leaders should address the imperative that politics should not be used to endanger the public health at the cost of a political victory. Fear and anxiety during a public health crisis should not be turned against health-care workers who are held to the ethical imperative of ‘do no harm’.